With the new vSphere release VMware also updated the licensing for this release. The diagram below gives a graphical representation about what features are included per vSphere edition. As you can see VMware will release vSphere 5 into 3 Editions : Standard, Enterprise and Enterprise Plus. These can be bought individually, but can also be purchased in Acceleration Kits which will give you a fixed amount of vSphere CPU / vRAM licenses and a vCenter license for a standard price out of the box. Also I need to mention that VMware changed it’s licensing model from a “per CPU with core / physical memory” to a “per CPU wit vRAM limitation”. No longer the limitation is on the amount of cores or physical RAM memory in a server, but the limitation is in the amount of virtual memory (vRAM) consumed by the hosted virtual machines. 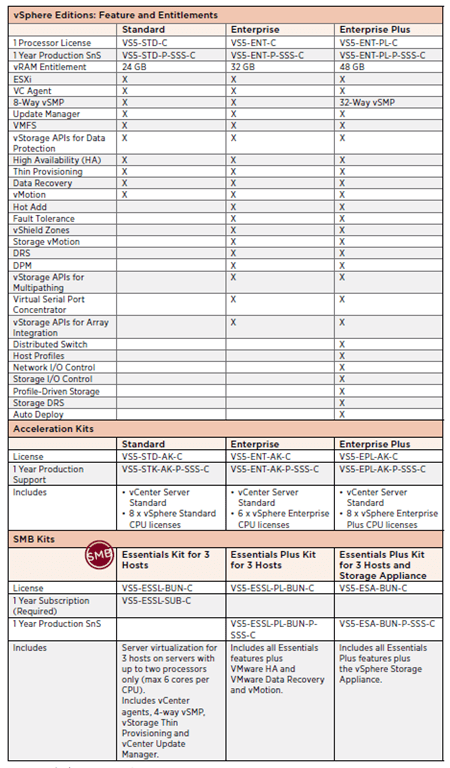 Besides the vSphere Editions you can also buy the (SMB) Essentials kits. These are specifically targeted at small businesses. Not all vSphere features are included in these releases, but enough to run your SMB workloads. For more information about licensing and how to obtain vShere 5 over here. The cost is outrageous. Today’s announcement is great day for other VM providers, they will be getting plenty of business based on this bone headed move by vmware. If the licensing model was tied to memory in use, maybe, but it is memory allocated to VMs. No more over provisioning memory or if you do, pay up. It takes one of the most valuable features of vmware and makes unusable. Thanks for nothing. Take your vsphere 5.0 and shove it.